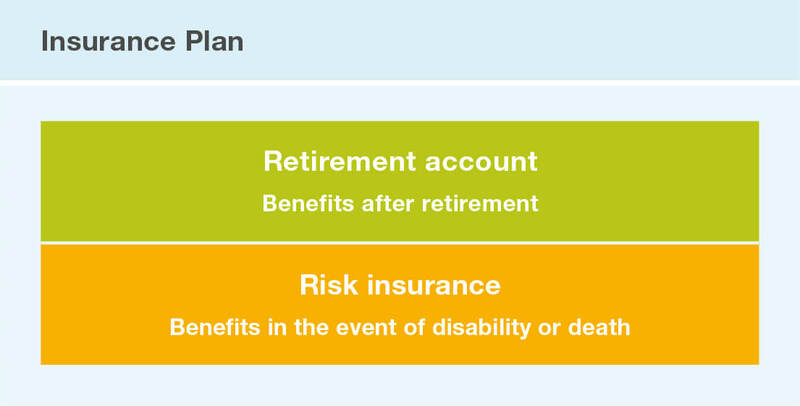 The insurance plan of Syngenta Pension Fund comprises a retirement plan, a capital plan and risk insurance. For retirement benefits, every insured member is provided with an individual retirement account, into which both the employee and the employer pays contributions. contributions, interest and voluntary extra contributions to purchase missing insurance years. The risk insurance covering disability and death is paid via additional risk contributions (at present 1 percent by employer and employee). The level of disability and survivors’ benefits depends on the insured remuneration. Who is insured in the Syngenta Pension Fund? All employees of Syngenta companies in Switzerland are compulsorily insured in the Pension Fund if the employment contract is for more than three months and the income exceeds the minimum as stipulated in the Occupational Pensions Act (OPA). Are part-time employees also insured? Part-time employees are insured in the Pension Fund if the annual base salary calculated on the basis of full-time employment exceeds the minimum income for compulsory insurance in the framework of the OPA. What components of pay are insured in the Pension Fund? The annual base salary up to a maximum of CHF 220 000, the target STI and any shift allowance are insured in the Pension Fund. What is understood by the target STI (Short-Term-Incentive)? The target STI corresponds to the variable remuneration defined by the work level. The cash incentive effectively paid out is the defining criterion for insurance in the Pension Fund.